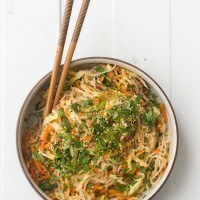 Cold Noodle Salad with Cabbage | Naturally. 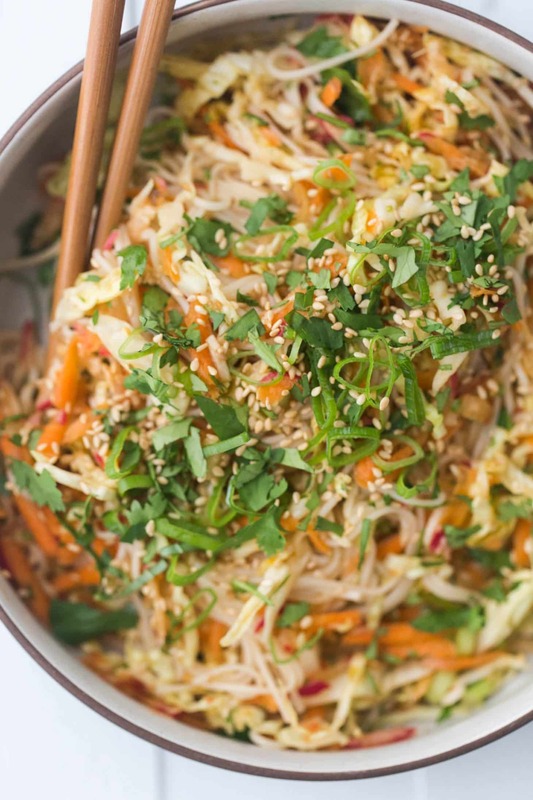 This cold noodle salad is another great for road trips and picnics meal. It’s next to no-cook as I love the crispness from the vegetables that are slightly marinated in rice vinegar and tamari. There’s room for riffing on this recipe but I hope I can convince you to try somen noodles. They are fast and soak up all the good flavors from the sauce and vegetables. 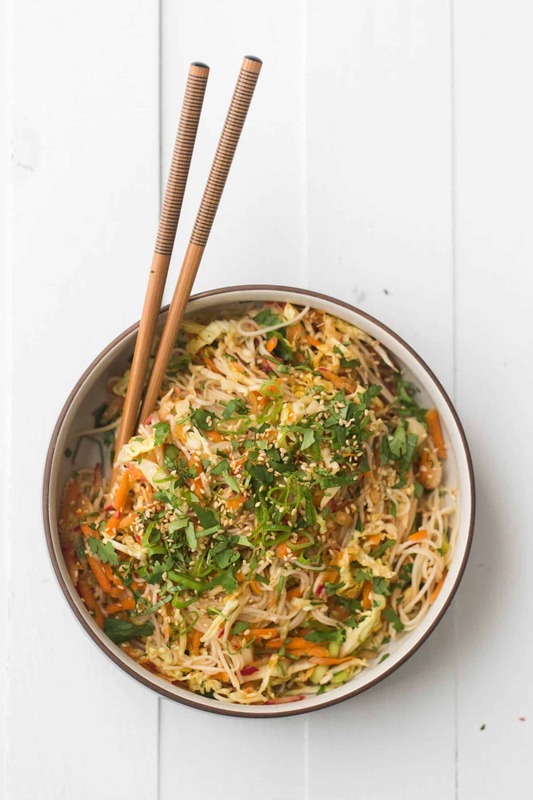 In a bowl, combine the cabbage, radish, carrots, scallions, and cilantro. Whisk together the ingredients for the sauce and pour over the vegetable mixture. Allow to sit while making the noodles. 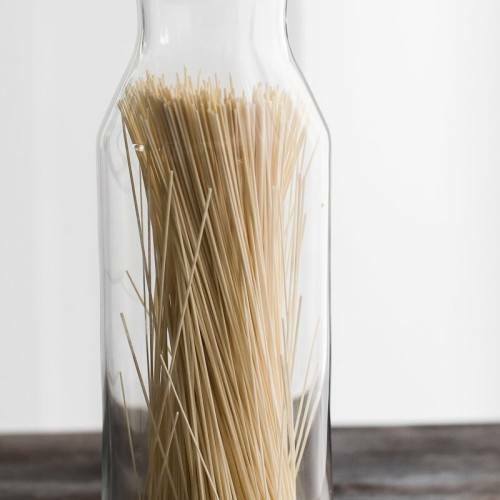 Bring a pot of water to a boil, add noodles, turn off heat and let noodles cook for 5 or so minutes, just until the noodles are tender. Drain and rinse until cold water. Add noodles and sesame seeds to the bowl with the vegetable mixture and toss until everything is well combined. Serve with extra sesame seeds, scallion greens, and extra tamari. The vegetables are second to the sauce and noodles (because it could be a meal without the vegetables, but who would want that?) I like the bite from the radish and the heft from the cabbage but those could easily be swapped for seasonal equivalents. This cold noodle bowl is perfect to pack up for lunch when you might not have a cooler or refrigerator. Greens: Depending on the time of year, kale or chard would work well in place of the cabbage- use a green that will still have a bit of crisp when dressed. Both of these options are great during the summer months. Peppers/Chilis: I opted to skip the peppers since they are in season yet but thinly sliced red peppers or a type of red chili would be great in place of the sambal oelek. The cold salad is a nice balance to a bit of spiciness. Gluten Free: While I think the somen noodles make this, try 100% buckwheat soba noodles or brown rice noodles if you’re looking to make this dish gluten free. Somen noodles are great because they take just a small amount of time to cook and soak up whatever flavors they are paired with. They are the perfect companion for cold noodle bowls and stir-fried vegetables. All of the recipes below use different noodles but would work well with somen noodles. I bought too much cabbage for a slaw last week… this looks to be the perfect way to use it! Yum! Can’t wait to try it out! It looks so delicious…thanks! This salad is totally my kinda scene. I always have all of those vegetables on hand and I cross the border to stock up that particular brand of somen. I also really dig the texture of cabbage when it’s been slightly marinated. Making this soon!